From the moment of birth, human beings move their limbs and bodies constantly. As they grow, they learn to crawl, sit, stand and walk. With movement, their lungs expand easily which encourages healthy blood flow through the body. As a result their internal organs function well, promoting efficient digestion and kidney function with robust muscle and bone tissue. However, if someone falls ill for a long time or becomes disabled, they may be unable to move around as before. In addition to the problems directly relating to their illness or disability, if a person becomes immobile for any length of time, there are additional risks associated with limited mobility. What Health Risks are caused by Immobility? Light-headedness. With the blood staying predominantly in the legs and feet, when the person goes to sit up or stand, they feel light-headed and may faint or fall over. Infections. Breathing becomes more shallow when lying down and fluid can pool in the lungs. Bacteria can grow easily in the pockets of liquid which may lead to chronic and severe infections. Weak muscles and stiff or painful joint movement. Brittle bones due to loss of calcium which are prone to fractures. Reduced blood circulation resulting in pressure sores and inflamed veins. How can the Risks be Reduced? 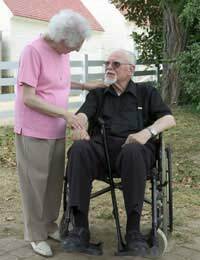 When caring for someone with limited mobility, there are a number of things that you can due to help reduce the risk of these added health problems. Primarily, you need to help your loved one move as much as possible and prevent them from falling and injuring themselves. Where possible, you need to encourage them to do as much as possible for themselves with the aim at making them independent again. Light-headedness on sitting or standing can be prevented by doing leg exercises before attempting to sit up, and hanging the legs over the side of the bed before standing. Encourage your loved one to practise deep breathing exercises and to regularly cough up any fluid in their lungs to help prevent infection. If they cannot move their bodies easily, ensure that their position in bed is changed frequently. A range of passive exercises can be done in bed to help prevent loss of joint movement and muscle tissue. Exercise is also the answer to help avoid blood clots due to poor circulation. If your loved one cannot do the exercises independently, you can hold their limbs and make them work. For the legs you can stretch, flex and rotate the ankles and holding the feet, move the limbs in a bicycling movement to work the knee joints. Similar exercises should be practiced regularly with both arms, remembering to stretch and bend each finger in turn and rotating the shoulder joint. Make sure that your loved one's diet has plenty of fibre and liquids to help prevent constipation. If necessary, speak to the doctor or district nurse and obtain some mild laxatives and/or enema preparations to ease painful bowel movements. Tests can be undertaken to check bone density but it is advisable to make sure that your loved one's diet contains a high level of calcium to help prevent brittle bones and consequent fractures. Bed sores are caused by prolonged pressure on an area of the body which has poor blood circulation. It is difficult to treat pressure sores on someone who has limited mobility and once the skin is broken, the area is extremely painful prone to infection. To prevent them, you need to change your loved one's position at least every two hours and keep the bed sheets as smooth as possible. Their skin should be clean, dry and if laying on their side, with a soft pillow placed between their legs. You should use pillows and rolled up towels or blankets under the head, neck, elbows and ankles to help support any area of the body prone to pressure. Health problems due to limited mobility are numerous and potentially fatal. You should not try to be your loved one's nurse, you are their carer. Don't hesitate to ask for professional help if you are concerned about any of the problems listed above; insist that a doctor or nurse visits your home.